A Wayne State University School of Medicine researcher has received a $1.9 million grant from the National Eye Institute of the National Institutes of Health for the project, "Role of AMP-Activated Protein Kinase in Bacterial Endophthalmitis." The study, led by Ashok Kumar, Ph.D., assistant professor of Ophthalmology, of Anatomy and Cell Biology, and of Microbiology, Immunology and Biochemistry in the School of Medicine and the Kresge Eye Institute at Wayne State University, will use a mouse model of bacterial endophthalmitis and cultured monocytes/macrophages to study the role of a metabolic gene AMP-activated protein kinase in regulating innate responses in endophthalmitis. "Over the last several years, studies from our laboratory have shown that in the retina, the main ocular tissue affected in endophthalmitis, the glial cells constitute the frontline cells of innate immunity," Dr. Kumar said. "Upon sensing pathogens such as bacteria, viruses or fungi, these cells get activated and secrete inflammatory mediators to recruit innate immune cells, such as neutrophils and macrophages, to combat the pathogen attack. These innate cells, particularly macrophages, play a pivotal role in resolving the inflammatory processes in the diseased eye." 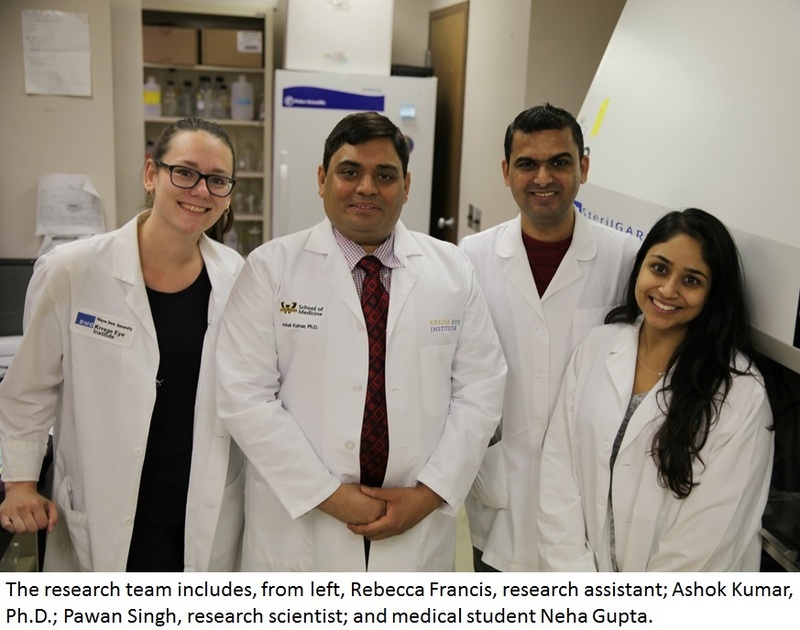 Dr. Kumar and his research team will investigate the link between AMP-activated protein kinase-regulated energy metabolism of monocytes and macrophages and their role in regulating innate responses in bacterial endophthalmitis. They hope to identify novel pathways and new means to treat blinding ocular infections. "One of the unique aspects of our study is that it is multidisciplinary, bridging three distinct disciplines of microbiology, immunology and biochemistry, collectively known as immunometabolism," Dr. Kumar said. "This is an emerging area of research that focuses on the role of metabolic reprogramming, including dynamic regulation of aerobic glycolysis, lipid synthesis and degradation, and mitochondrial activity on the outcome of immune responses. The long-term goal of our study is to determine how cellular metabolism of immune cells impacts their ability to kill pathogens and mount protective immune responses to defend the eye from infection." Because of an aging U.S. population and the increasing prevalence of antibiotic-resistant bacterial pathogens causing ocular infections, this study is of critical importance as it may lead to the development of new anti-inflammatory therapeutics for the prevention and treatment of bacterial endophthalmitis. "We are optimistic that the anticipated findings of our research will spur activity into the development of approaches to manipulate the newly-identified metabolic pathways to affect macrophage function in clinically-relevant settings, ultimately reducing the number of patients with endophthalmitis through new treatment approaches," Dr. Kumar said.